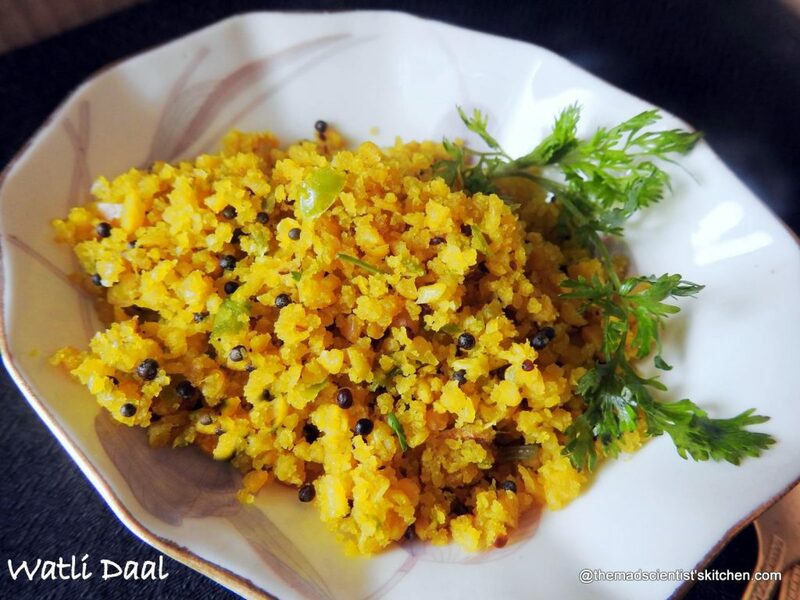 Watli Dal a snack made from soaked Chana dal and made for Gudi Padwa|Ugadi|Hindu New Year! The soaked dal is ground with green chilli before it is cooked. 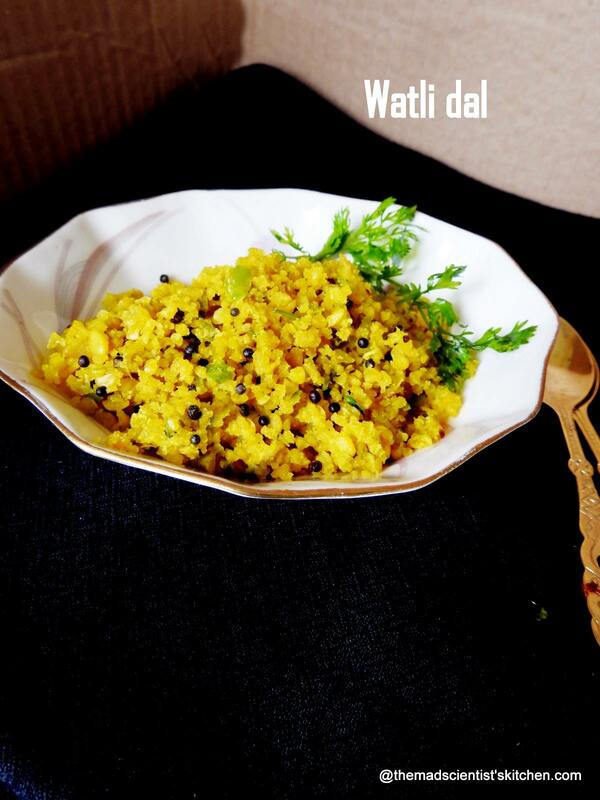 Watli dal tastes best warm with chilled panha. Chana dal is used to make Ambe dal too but then Ambe dal is not cooked and uses raw mango. Here is the recipe for Ambe dal do make it when you start getting raw mangoes. I am sharing this now as lentil salads and sides. This is a compilation of the different salads sent for various events, check it out here. 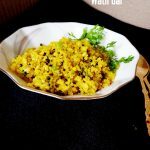 A delicious snack from chana dal or Bengal gram dal. Wash and soak for 5 hours the chana dal in water. Discard the water and grind to a fine paste the chana dal with green chilli, turmeric, hing and salt. Heat oil in a thick kadhai/wok and add the mustard seeds once they splutter add the dal mixture and stir it well. Sauté the mixture stirring it at frequent intervals. Take care the mixture should not stick to the bottom. As the dal starts drying out add the coconut, if using, and sauté on medium heat. Your watli dal is done when the mixture dries out and each grain is separate. Like my friend said the consistency of course sand. Serve garnished with coriander leaves and freshly grated coconut. I like some lime with mine. Avoid the temptation of raising the heat all throughout the process of cooking. Ah ! Very interesting ! I make something similar but with cucumbers , will give this a try . Very interesting version Arch, we make this differently..so interesting to read about different ways to make using chana dal..
A very interesting recipe… I feel it’s good as an after workout protein snack… I love chana dal after all! I didn’t know this version of chana dal. Look interesting and tempting. Wish i get that plate rite now, feel like having this extremely delicious watli dal. 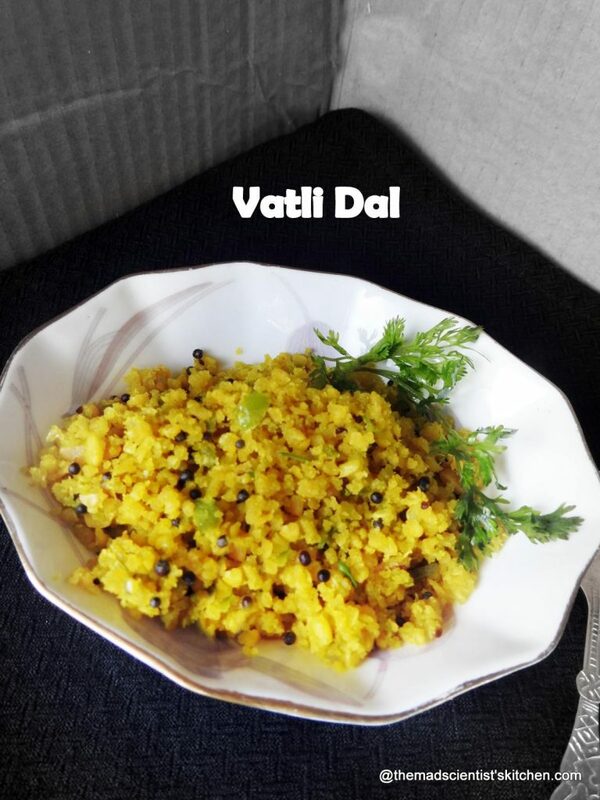 I love Watli dal. It is so flavorful! Nice recipe! An interesting way to prepare chana dal. I’d love to have it with kadhi and rice. That is a great recipe for snacking. Love the protein burst in the recipe. Lovely recipe. Ohh very nice dish, we make this recipe too. Only thing is we dont mash the dal after cooking. Looks amazing. sounds delicious ! almost like paruppu usli !